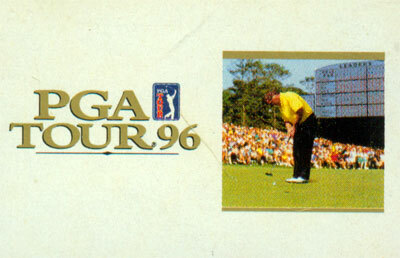 PGA Tour 96 was the last of the series released for Sega's 16-bit console, and technologically the most advanced one. Instead of offering several generic courses, the three available (Spyglass Hill, Sawgrass and River Highlands) are in 3D, with height differences visible (as well as the limited 3D abilities of the console allow). The player can either chose to play as one of the 10 PGA Pros (whose swings were digitized), or go Pro - the game keeps track of statistics (longest drive, driving accuracy, best round, etc), a game (Tournament, Strokeplay, Skins, Match and Shootout), as well as a replay. Gameplaywise, PGA 96 uses the tried-and-proved triple click system - one to start the swing, other to set strength and a final one for accuracy. It's possible to fade or draw the ball (to bend the trajectory), add backspin and pitch or chip the ball (for some medium range attempts at the hole or go above a bush).The difficulty level affects mostly the leniency of the triple click hit areas - while at novice it is possible to let the accuracy a bit off-center, in pro levels the ball goes where your swing took it - no excuses taken. However, only in Pro it is possible to make the longest drives, as the amateur and novice levels take a few yards from the total capacity of the club.